Across Australia, the desire for larger, more luxurious apartments in smaller, boutique developments is on the rise, increasingly lending the apartment lifestyle a distinctly house-like feel. Across Australia, the desire for larger, more luxurious apartments in smaller, boutique developments is on the rise, increasingly lending the apartment lifestyle a distinctly house-like feel. 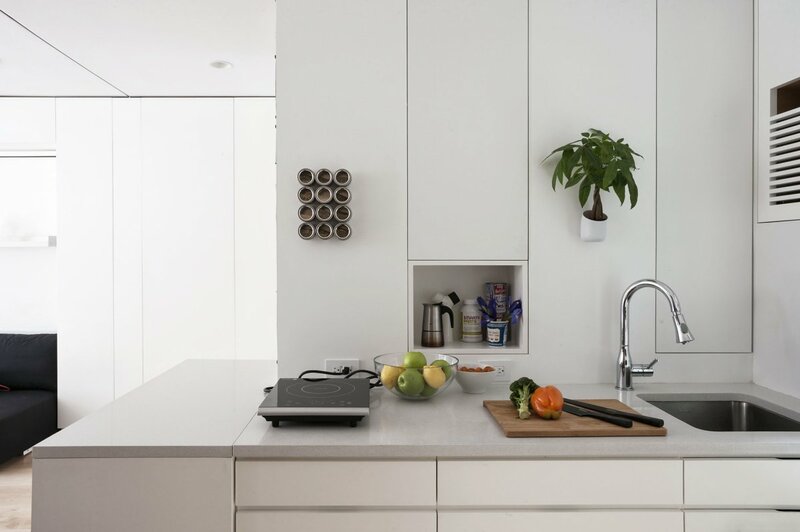 But over in New York, one innovative environmentalist is proving that ample square footage isn’t necessarily a prerequisite for creating a full and varied way of living. Graham Hill, the founder of architecture and design consultancy Life Edited, has spent the last five years actively engaged in challenging ideas of luxury and space. During his employment at TreeHugger.com, Hill became interested in discovering a way to overcome the negative effects larger homes can have on the environment. 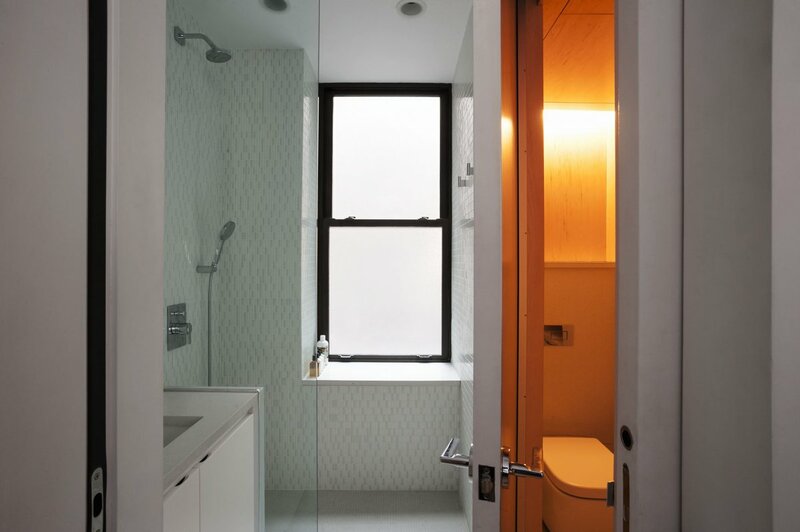 His current abode is a 420-square-foot New York City studio apartment. 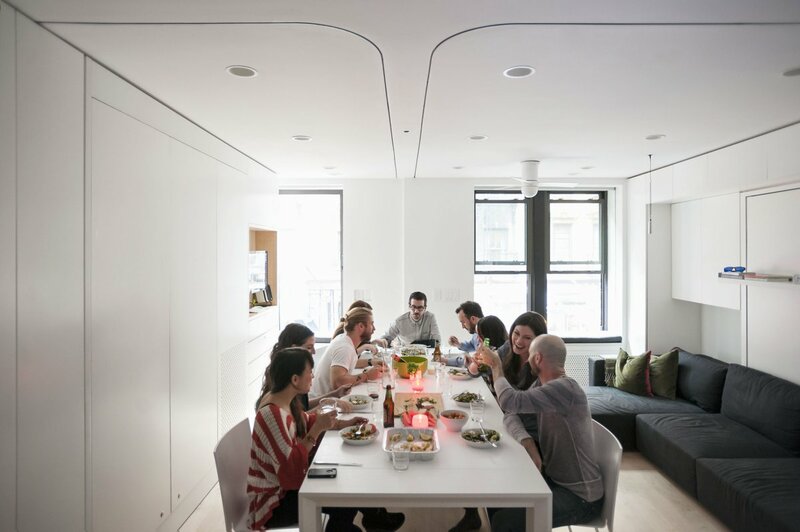 This may sound small, but thanks to the innovative designs born out of a competition Hill launched back in 2010, the apartment, in fact, has 1,000 square feet of functionality. “We partnered up with a local design/build firm in New York called Composite Fabrication + Construction, who translated the designs to make them ready for New York’s Department of Buildings,” Hill said. Rethinking traditional approaches to interior design, this apartment abounds with dynamic elements that can flex to the occupant’s needs at any given moment. By focusing on adaptability and incorporating various space-saving hacks, the humble environment is maximised beyond its perceivable potential. 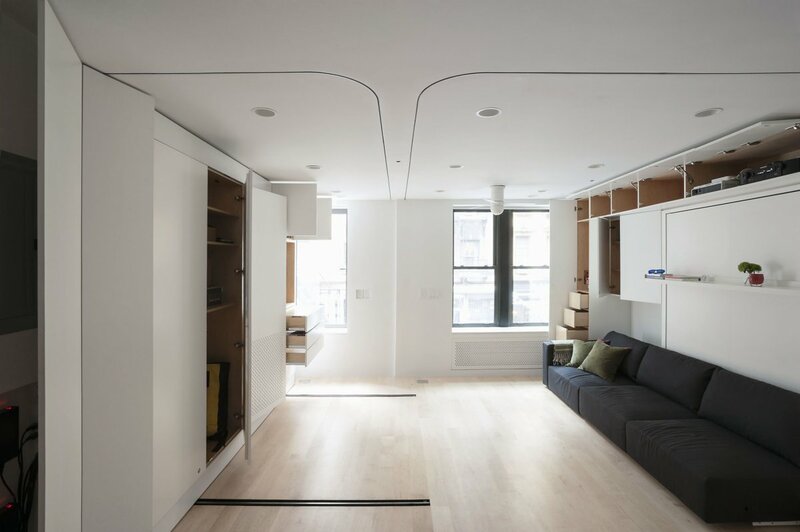 One of the apartment’s main innovations is the south wall, which sits between the couch and the bathroom to help with interior zoning, while also serving as a well-sized wardrobe. Also in the wall, dining furniture including chairs and table extensions are stored. These can be laid out in the central living space to transform the 17-inch Resource Furniture Goliath Table into a 115-inch banquet setting, fit for a party of ten. When the guests depart, this incredibly adaptable table can be neatly tucked away in the breakfast bar, freeing up the central space to be enjoyed in an entirely different way. For example, the extension wall includes a Da-Lite projection screen, making an effortless task of turning the apartment into a home cinema for the evening. One of the great inconveniences of living in a small one-bedroom apartment tends to be the missed opportunity to have family and friends stay the night. 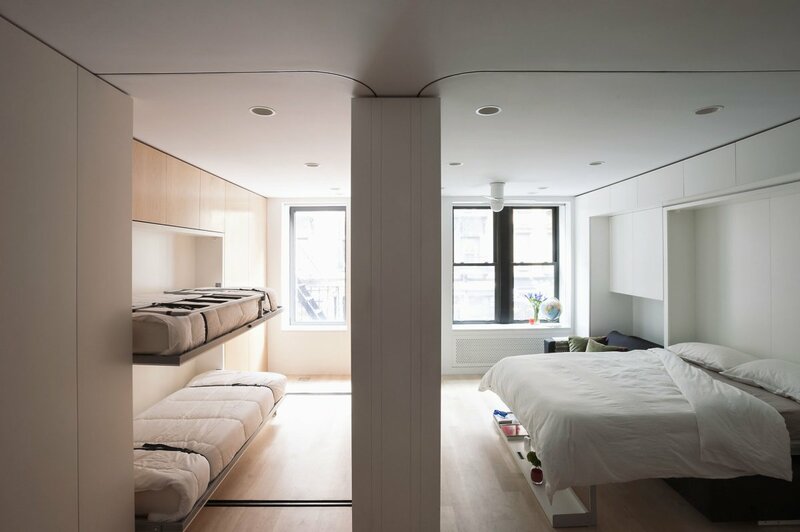 But with three guest beds that conveniently pop out from the wall as required, this apartment puts the issue to rest once and for all. The ‘guest room’ also doubles as a bike storage cabinet, so it won’t feel like a waste of space if you experience a hosting drought. Fitted with energy-saving appliances and a solar power charging station, the environmental benefits of the small living space are compounded. 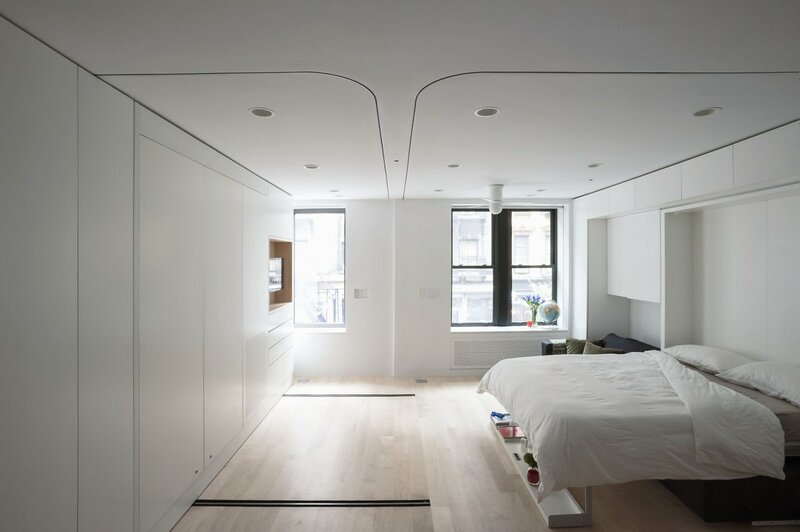 Incredibly, this futuristic apartment has been built inside a 100-year-old co-op building in Manhattan. “Learning how to upgrade old spaces is vital to thinking about how our homes will look in the years to come,” remarked Hill. While it might take a bit more to convince most of us to give up the dream of a beautiful open-plan apartment, these innovations can certainly make a big impact on the liveability of smaller spaces. Discover more lifestyle articles about apartment living here, or search apartments here.